John G. Scott et al. 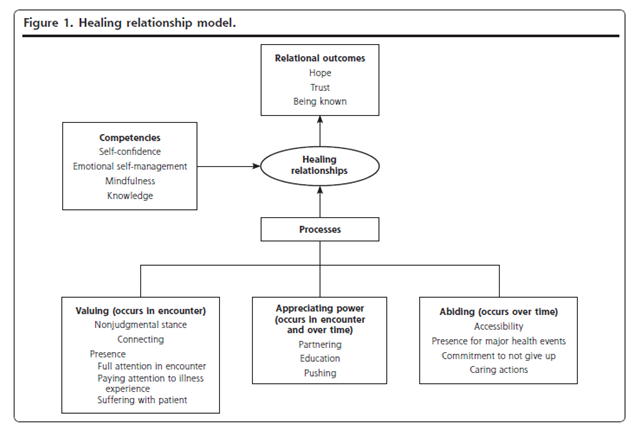 Understanding Healing Relationships in Primary Care. Ann Fam Med July 1, 2008 vol. 6 no. 4315-322. The first-year of fellowship has a lecture on “healing relationship” emerged from continuity of care. Healing relationship is difficult for me to understand because of lack of a corresponding experience. It seems to take so much training, experience and wisdom as a family physician, and I have wandered what kind of training I should do. I found an article on healing relationships written in terms of required components of doctors, patients, and the relationships between doctors and patients. It would help me, a wandering family physician trainee. Clinicians often have an intuitive understanding of how their relationships with patients foster healing. 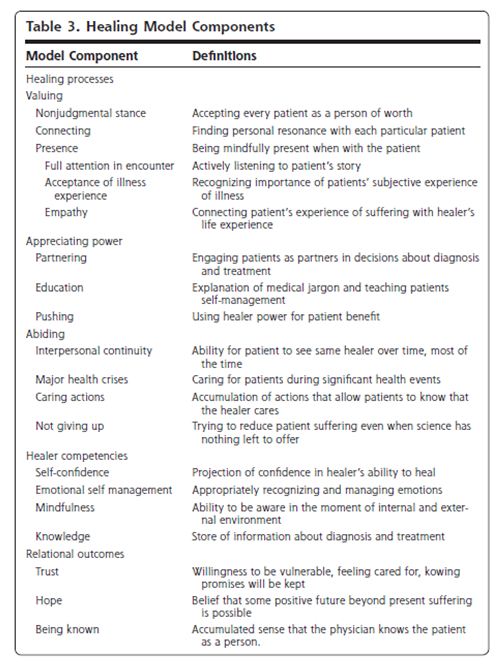 Yet we know little empirically about the experience of healing and how it occurs between clinicians and patients. Our purpose was to create a model that identifies how healing relationships are developed and maintained. Three key processes emerged as fostering healing relationships: (1) valuing/creating a nonjudgmental emotional bond; (2) appreciating power/consciously managing clinician power in ways that would most benefit the patient; and (3) abiding/displaying a commitment to caring for patients over time. Three relational outcomes result from these processes: trust, hope, and a sense of being known. Clinician competencies that facilitate these processes are self-confidence, emotional self-management, mindfulness, and knowledge. See table 3 and Figure 1 for details. Eric J. Jacobs, PhD.et al.Waist Circumference and All-Cause Mortality in a Large US Cohort.Arch Intern Med. 2010;170(15):1293-1301.